Join us at our 5th Annual Golf Outing at the beautiful Little Turtle Golf course! All Conway Center members (family businesses and service providers) and any Central Ohio family-owned business may participate. Golf scramble begins at noon - lunch provided on your cart. Registration Deadline is Friday, July 6. 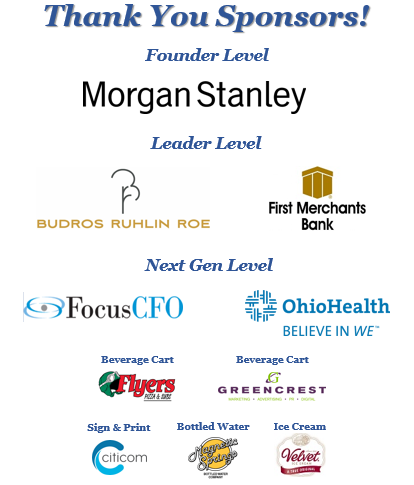 Thank you to our sponsors: The Fortis Group at Morgan Stanley, Budros Rulin Roe, First Merchants Bank, FocusCFO, Ohio Health, and beverage cart sponsors Flyers Pizza and GREENCREST. With in-kind support from Citicom, Magnetic Springs and Velvet Ice Cream. Thank you also to our hole sign sponsors! : Emens & Wolper Law Firm, Flyers Pizza, Golf Car Company, Gordon Flesch Company, McGohan Brabender, Ohio Power Tool, Reitter Stucco, Rick Miller Communications, and Spartan Logistics. 12:00 noon - Golf scramble begins; lunch provided on your cart. Not a golfer? Join us for the post-golf reception! $35 Reception Only fee. Reception starts at approximately 4:00 pm and includes appetizers, 2 drink tickets and the opportunity to participate in the Basket Auction to win great prizes!